Raiders.com Mailbag: Who has impressed so far this training camp? Once again, thanks for all the submissions, including the funny ones; I’m genuinely entertained each week when we go through this exercise. Anyways, on to the questions! From: RaiderMo1 – Who’s shown the most improvement? EP: Mo, that’s kind of a tough question there. Still less than two weeks into training camp, you could say that all the guys on the roster are better today than they were yesterday, but that’s kind of a copout answer. So, how about I do this, and give you one guy who’s really impressed me in the early goings of camp. Drum roll, please… Marcell Ateman is my guy here. We all knew what to expect from Derek Carr, Bruce Irvin, and the rest of the Raiders’ studs, but the rookie from Oklahoma State has been a pleasant surprise so far. It seems like each day he’s made some type of play to make you take note of his 6’4” frame, so he’s been a guy that I’ve had my eye on. 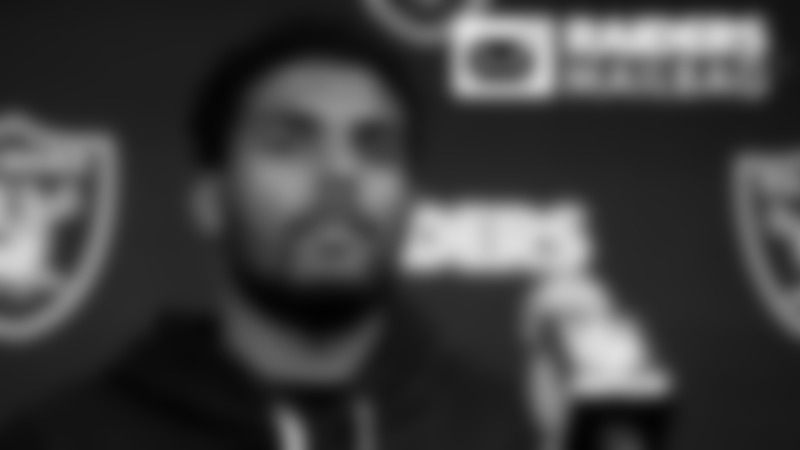 At this point, he just needs to keep stacking good days, and then we’ll get an even better idea of what he brings to the table once the preseason rolls around. From: Lili_Parra707 – How long you guys gonna be in Napa? EP: We’re officially breaking camp at the team’s Napa Valley Training Complex August 16, but there’s a lot that will happen between now and then. First things first, the Detroit Lions come to town August 7 for a pair of joint practices with the Silver and Black, and then the two squads will actually open the preseason against each other on August 10 at the Oakland-Alameda County Coliseum. In total, the Raiders have 10 practices left in Napa, so like I said, there’s a ton still left to accomplish. From: _Stevie30_ - Will you guys continue to do the game day trailer videos? EP: You bet; I might be biased, but I think the trailers are one of the coolest pieces of content we produce. S/O our entire video squad at Silver and Black Productions; those folks are the best in the business.  From: 17_Stevenharry – Is Derek Carr going to be back to MVP candidate shape? 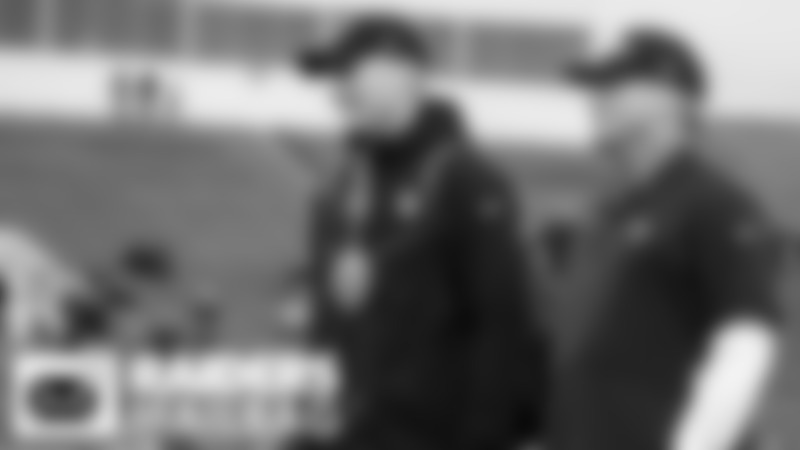 EP: Boy, I sure hope so, and from the sounds – and looks – of it, there’s a chance that is indeed the case this year. Let’s get this out of the way from jump street; you really can’t let last year’s offensive output sway your opinion of D.C. or any one on the Raiders’ offense. Last year was not indicative of what this team can do offensively; I know that, and you know that, and I have a feeling we’ll see much more of the 2016 version of Derek Carr this year. When asked about the progression of the Raiders’ franchise quarterback, veteran tight end Jared Cook said that Carr “looks like a completely different person” in his eyes, which should be a welcome sound to the ears of Raider Nation. Time will tell if Carr once again finds himself in the MVP mix, but one thing we know for sure is that he has the talent to be there. 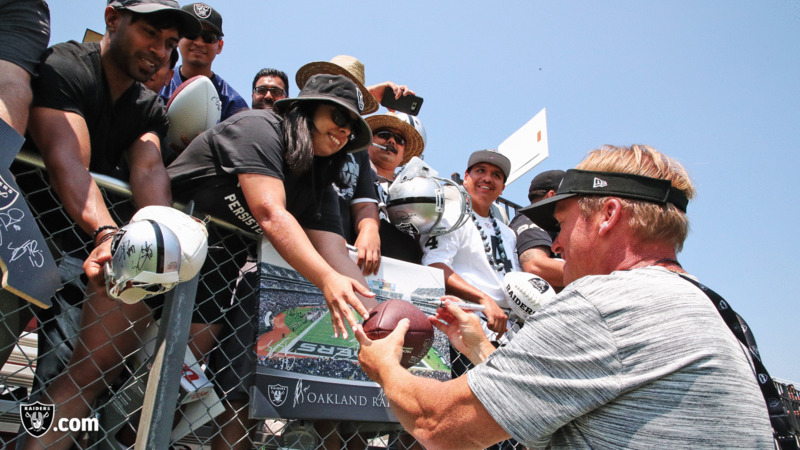 Oakland Raiders head coach Jon Gruden signs autographs for fans after practice at 2018 Training Camp at Memorial Stadium, Saturday, July 28, 2018, in Napa, California. Oakland Raiders linebacker Tahir Whitehead (59) signs autographs for fans after practice at 2018 Training Camp at Memorial Stadium, Saturday, July 28, 2018, in Napa, California. Oakland Raiders wide receiver Martavis Bryant (12) signs autographs for fans after practice at 2018 Training Camp at Memorial Stadium, Saturday, July 28, 2018, in Napa, California. Oakland Raiders wide receiver Amari Cooper (89) signs autographs for fans after practice at 2018 Training Camp at Memorial Stadium, Saturday, July 28, 2018, in Napa, California. Oakland Raiders quarterback Derek Carr (4) signs autographs for fans after practice at 2018 Training Camp at Memorial Stadium, Saturday, July 28, 2018, in Napa, California. Oakland Raiders offensive tackle Kolton Miller (77) signs autographs for fans after practice at 2018 Training Camp at Memorial Stadium, Saturday, July 28, 2018, in Napa, California. Oakland Raiders defensive tackle Justin Ellis (78) signs autographs for fans after practice at 2018 Training Camp at Memorial Stadium, Saturday, July 28, 2018, in Napa, California. Oakland Raiders tight end Jared Cook (87) signs autographs for fans after practice at 2018 Training Camp at Memorial Stadium, Saturday, July 28, 2018, in Napa, California. Oakland Raiders tight end Pharaoh Brown (81) signs autographs for fans after practice at 2018 Training Camp at Memorial Stadium, Saturday, July 28, 2018, in Napa, California. Oakland Raiders defensive end Arden Key (99) signs autographs for fans after practice at 2018 Training Camp at Memorial Stadium, Saturday, July 28, 2018, in Napa, California. Oakland Raiders defensive tackle Maurice Hurst (73) signs autographs for fans after practice at 2018 Training Camp at The Oakland Raiders Napa Valley Training Complex, Sunday, July 29, 2018, in Napa, California. Oakland Raiders defensive end Mario Edwards Jr. (97) signs autographs for fans after practice at 2018 Training Camp at The Oakland Raiders Napa Valley Training Complex, Sunday, July 29, 2018, in Napa, California. Oakland Raiders defensive lineman Tank Carradine (96) signs autographs for fans after practice at 2018 Training Camp at The Oakland Raiders Napa Valley Training Complex, Sunday, July 29, 2018, in Napa, California. Oakland Raiders wide receiver Jordy Nelson (82) signs autographs for fans after practice at 2018 Training Camp at The Oakland Raiders Napa Valley Training Complex, Sunday, July 29, 2018, in Napa, California. Oakland Raiders defensive tackle Justin Ellis (78) signs autographs for fans after practice at 2018 Training Camp at The Oakland Raiders Napa Valley Training Complex, Sunday, July 29, 2018, in Napa, California. Oakland Raiders wide receiver Johnny Holton (16) signs autographs for fans after practice at 2018 Training Camp at The Oakland Raiders Napa Valley Training Complex, Sunday, July 29, 2018, in Napa, California. Oakland Raiders placekicker Giorgio Tavecchio (2) signs autographs for fans after practice at 2018 Training Camp at The Oakland Raiders Napa Valley Training Complex, Sunday, July 29, 2018, in Napa, California. Oakland Raiders linebacker Azeem Victor (57) signs autographs for fans after practice at 2018 Training Camp at The Oakland Raiders Napa Valley Training Complex, Sunday, July 29, 2018, in Napa, California.